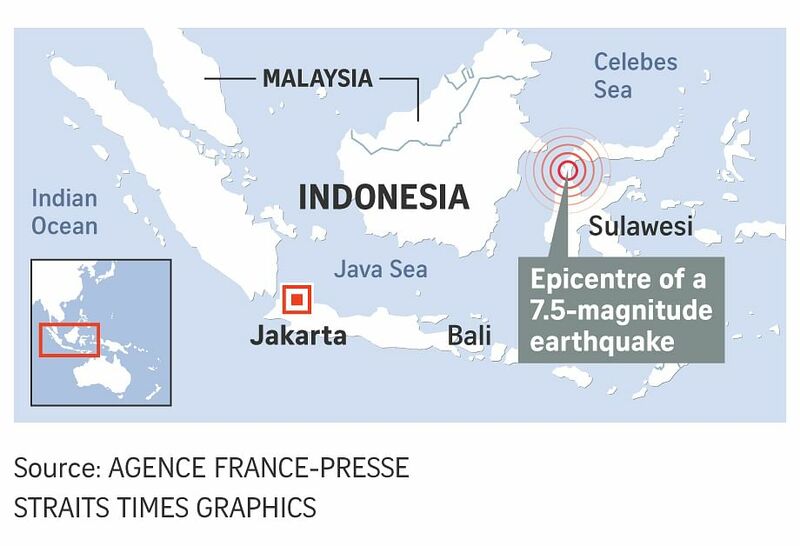 JAKARTA (REUTERS) - Indonesia's geophysics agency lifted a tsunami warning 34 minutes after it was first issued following a major earthquake that sent huge waves crashing into the north-eastern coast of Sulawesi island, killing hundreds and leaving thousands more homeless. The 7.5-magnitude quake and tsunami, which hit the city of Palu about 1,500km from Jakarta and further along the coastline, killed at least 384 people. Officials said on Saturday (Sept 29) that the death toll was likely to rise. Hundreds of people had gathered for a festival on the beach in Palu last Friday when waves as high as 6m smashed onshore at dusk, sweeping many to their deaths. The agency said it followed standard operating procedure and made the call to "end" the warning based on data available from the closest tidal sensor, around 200km from Palu. "We have no observation data at Palu. So we had to use the data we had and make a call based on that," said Mr Rahmat Triyono, head of the earthquakes and tsunami centre at BMKG. He said the closest tide gauge, which measures changes in sea level, recorded only an "insignificant" 6cm wave and did not account for the giant waves near Palu. "If we had a tide gauge or proper data in Palu, of course it would have been better. This is something we must evaluate for the future," said Mr Triyono. "Based on the videos circulating on social media, we estimate the tsunami happened before the warning officially ended," Mr Triyono said. The scenic town of Palu sits at the mouth of a narrow bay in north-eastern Sulawesi and is home to around 380,000 people. It was hit by a tsunami in 1927 and 1968, according to Indonesia's national disaster mitigation agency (BNPB). Dr Baptiste Gombert, a geophysics researcher at University of Oxford, said it was "surprising" the quake had generated a tsunami. Last Friday's quake was recorded as a "strike-slip" event, where neighbouring tectonic plates move horizontally against each other, rather than vertically, which is what usually generates a tsunami. "There is some speculation that there was a landslide under the sea which displaced a lot of water and caused the tsunami," Dr Gombert said, adding that the narrow bay may have concentrated the force of the waves as they moved toward the shore. Mr Sutopo Purwo Nugroho, spokesman for Indonesia's disaster agency, told reporters his team had been "preparing to send public warnings that were easy to understand" when the tsunami warning was "suddenly ended". The communications ministry said repeated warnings were sent out to residents via text message, but Mr Sutopo said the quake had brought down the area's power and communications lines and there were no sirens along the coast. Indonesians took to social media to question the BMKG's move to lift the tsunami warning and a failure to release information in a timely manner. "So upset... the warning was lifted.. although a tsunami happened..." said one Twitter user @zanoguccy in a direct message to BMKG.